I was reading the comments on my previous post (because I do that) and when I got to amber in albuquerque’s I had one of Those Moments…when suddenly, I have a Great and Tremendous Insight! And it was this: Hey! Y’all do not actually know me in person and have my full life’s history and such! She’s absolutely right. For a normal person, a professional manicure is so not a “need”. But of course…this is me we’re talking about here. It isn’t about looks, and certainly isn’t for pleasure because frankly, a nail fill is not one of life’s little pleasures. But I do it anyway, because I need my Nails O’Steel to play my harp. On this lovely creature, my Most Excellent Teacher taught me to play with my elbows mostly tucked in, my wrist semi-fluid, my hands kept slightly curled unless I had to stretch them for an octave or something, and the strings plucked firmly using the pad of the finger. Nails on harp strings (especially gut strings) often make a distinctive (and unpleasant) buzzing sound. Hence, a classical harpist keeps his or her nails very short and well-filed. And I have definitely found that with gut strings – brother, you’d better avoid those nails at all costs. This is a full-sized lever harp, commonly called a folk harp. It has some limitations in what kind of music I can play; it has fewer strings than the concert harp, it’s difficult to change keys or hit accidentals (you know, sharps and flats?) in the middle of a piece and is limited to only two notes per string: lever down (natural) or up (sharped). The pedal harp’s pedals, operated by your feet so your hands don’t have to find time in their busy schedule to flip levers, give you three notes per string, the flat, natural and sharped for up, center, and down respectively. When I first got her I naturally played the way I’d been taught by my Most Excellent Teacher: Classical style, French flavor. Pad of the finger, no nail EVER. I was goofing around one day during the doldrums of winter with different sounds I could make and found that with a confident nail-pluck (as opposed to the embarrassed sound of an accidental nail brush on the string), I got a neat, crisp, ringing note. No buzz. Just ringing. It was a sweet, pure sound…not “unlike anything I’d ever heard” exactly, but it got me thinking. Lots of volume. Not a lot of effort. Hits a sweet spot, sound-wise. Uses the nail of the finger (which doesn’t tend to feel pain if you rub it against nylon for six solid hours two days in a row) instead of the pad (which, uh, does). So I started growing my fingernails out to experiment. I loved the sound, but it was always a fleeting experiment. My natural nails are now as they have ever been: About as strong as wet toilet paper. No sooner did they clear the ends of my fingers than rrrrrrip! Off they tore. @*^&@!!! I tried liberal applications of Sally Hansen products with names like “Nails That Won’t Ever Break We Swear Honest”. They lied. I ate gelatin and took vitamins. Stirred powders into water that claimed you would have hair fifty seven feet long and nails of a goddess in three weeks. Uh, yeah. They worked about as well as you think they would. Finally, with a bit of trepidation because I had a really bad experience with acrylics in the early 80s (so…much…burning…! ), I went into a nail salon and got a set of acrylic nails. After a lot of false starts with length and shape, I finally hit on the Perfect Deal: Half a centimeter past the end of my finger, well-rounded but not pointy. By the end of that winter break, I’d developed a whole different style of playing. My hand has gone from “properly positioned” to really open and loose – I can play for hours without hand fatigue, even if I’ve been, uh, well…a little less than diligent about daily practicing for a while. The nails give me a big sound, as if the harp is being electronically amplified, without half the effort the pad of the finger takes for equal volume. It’s also a bright sound. The pedal harp tends to sound like…warm, melted milk chocolate. Rich, a little heavy, kind of round. The sound I get from my Dusty with my nails is more like soda pop. Bright, sparkling, fast in a way that has nothing to do with tempo. It dances in the air. Uh, yeah. I kinda like it. I can also play wicked fast. Way faster than I ever could with the pads of my fingers. And I can do other nifty sound effects, like a glissando using a nail tip or back, or a good sharp ‘drumming’ on the soundboard (rat-a-tat-tat! )…all kind of neat stuff. I’ve been playing this way for fifteen years now. I can’t even remember how I’m “supposed” to play, you know, Classically-speaking. I remember bits and pieces, but they feel alien to me when I try to emulate them. It’s really weird to have a nail fill on your “must have” list, just as it’s profoundly odd to have “breaking a nail” be something on the list of “events which require that I drop everything and rush to handle this” – especially for a woman like me who is, uh, well, let’s just say “somewhat careless with her overall daily appearance.” Let’s see, checkin’ the look today…oh yeah, we’ve got hair that could really use some shampoo, no makeup again, peeling flesh from the recent sunburn (nice), jeans with a lovely bleach spot. But! My (new) hair tie? Matches my t-shirt. That’s right. I’m all put together, today. Anyway…that’s the long-winded explanation of my putting nail fills on my “must do” list even when I’m on a money-hoarding kick that I didn’t think to mention before because, well, you know…I just sorta thought you all knew about that. Makes more sense now! I wasn't questioning whether or not it's a "need", more of a "Tama has her nails done?" thing. I've only been reading since your trip to see the Yarn Harlot and figured I just didn't "know" you yet. Not that you playing the harp wasn't unexpected! WHEN do you find the time??? As a side note, I've always wanted to learn to play the harp. Don't know why either - it's not like I've ever even seen one in person let alone heard it played. Maybe because my parents said I couldn't? I wanted to play clarinet in the band - orthodontist said no, you can play the flute. So I did until I could join the orchestra. I wanted to play either violin or cello - dad said no, the violin plays high notes and the cello is too large to bring home on the bus, play the viola. I wanted to play the piano, again, dad said no. By that time he'd realized I'm not musically inclined and was already sitting through both band and orchestra concerts and me practicing at home - I think he'd had enough! Wow! I had no idea you played the harp! Do you do a lot of gigs now? How do you find the time? I was also really surprised you had your nails done because it just doesn't seem like you, but this explains it. *wistful sigh* I love harp music...wish I could hear you play sometime. That's another item on my "list of things to learn before I die" - playing the harp. I'd have to do the gel nails too, mine are pathetic. Of course I had a piano teacher who always said "I want to hear the PIANO, not your fingernails!" 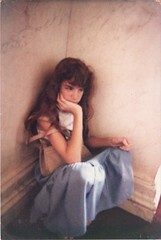 Thus 25 years later, I still can't stand to hear my nails "click" on the piano keys. But I'm sure I'd adjust. Suffering for my art and all that. Hey - you should get some video of you playing the harp and post it on YouTube! Then we could all hear you! Please, please, pretty please with cashmere on top? I love my nails to look nice and shiney, I loved my acrylics. My natural nails are toilet paper, too. However, since I quit work and only knit (with no hand pictures) I gave up the expense. That is my choice and I should not decide for you what you choices should be. how do you haul your harp around? It looks heavy! My harp isn't actually as heavy as it looks. It only weighs about 30 pounds! That whole center part, the big part, is hollow, and the wood around the box is intentionally thin. I put her into a soft canvas case, zip it up, put the strap onto my shoulder and off we go! A pedal harp, though, is another animal. They weigh from about 80 pounds on up - you use a padded hand cart to move them around. And getting them in and out of vehicles can be a pain - between that, the cost, and the fact that frankly 75% of the events I was being asked to play were all about the Celtic stuff, I went with the biggest folk harp I could get. I knew you used your nails to play (and that was why you need acrylics), I just didn't know how you used them. Thanks for explaining the technique. The only harpist I've ever met in the flesh is the one who played at my wedding (and she played a folk/pedal harp, too). I was a bit too busy that day to notice her technique. Okay, now that does explain it. I'll admit to momentary pause that you have your nails done--I mean, based on your own descriptions of your general attention to your appearance. It sounded like an uncharacteristically high-maintenance activity. Now it makes perfect sense. I vote for a You Tube video asap. I too, was wondering about the money and the rest of your lifestyle and how the nails fit it...which is why I was (I hope) only mildly snarky in my last comment...sorry for that by the way, I deal with epic fiscal folly and hypocrisy daily in my neighborhood and, what with gas/food prices, etc., I've been a little testy about stuff (Indiana Jones Lego Wii games & the like)being considered "needs". And based on your, most excellent, reason for having the nails, that's all the more reason to take care of them regularly (arrange your other errands around that standing nail appointment). You're not just taking care of your nails, you're taking care of your mind and soul too ('cause if harp music doesn't do that, I can't imagine what would). So, my question is whether your harp is all wire strung, or if you use nylon & wire. Because in ye olden days, harpists who played with their nails were on a solely wire strung harp (clarsach & all that). So are you a traditionalist in that respect? I'm guessing not, from your post. Second, I commend you for finding the time to practice. I am still letting my giant beast slumber until my children are old enough to a) be quiet while I am practicing and b)stay the h$%% away from the harp when it's uncovered. I'm guessing that will happen in...oh, about three years?? Heh - no, I'm not a traditionalist. 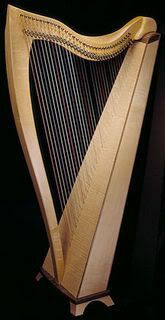 My big harp is nylon, top to bottom - even the bottom octave is nylon-wrapped brass. I do have a small wire-strung, 22 strings, traditional clarsach styling. It's even made out of oak, which is not usually a wood of choice...it was a really early model for the builder, and I suspect he was going for some kind of Druidic-connection, there. I've never learned to play it well, though. The spacing is really different, super-narrow (like a lot of wire strungs are) and irregular (uh...usually they're REGULAR in their narrowness, though) (early model!). I keep intending to get around to becoming familiar with it...and then I don't. I'm still waiting for my kids to leave the harp alone. And ME alone while I practice on it. I spend a lot of my practice sessions with one leg thrust out to keep them OFF ME. "It's mommy's turn right now! Back off! OFF! BACK OFF!!" It's like fending off midget music-zombies. "Euuuuhhhhnnnn! Need...play...harrrrrrp..."
Or piano. Or dulcimer. Or whatever else I think I'm going to be able to play without attracting too much attention. I can't even sing without someone jumping in with both feet. Even Captain Adventure does it to me...I started singing this ballad the other day, he looks at me, jumps to his feet and starts yell/singing the theme to the Mickey Mouse Clubhouse. Sigh. Maybe...in another three years...?